Is cheddar cheese addictive? How about steak? Or Sugar? In Breaking the Food Seduction, PCRM president Neal Barnard, M.D., present the evidence that these foods might actually have brain effects that keep you coming back, despite their health risks. 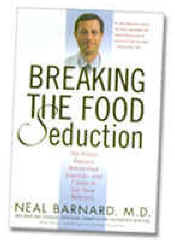 Breaking the Food Seduction is available from the PCRM Marketplace. University of Michigan researchers showed that chocolate does not merely tickle your taste buds; it actually works inside your brain in much the same way opiate drugs do. The researchers gave 26 volunteers a drug called naloxone, an opiate-blocker used in emergency rooms to stop heroin, morphine, and other narcotics from affecting the brain. It turned out that naloxone blocked much of chocolate’s appeal. When they offered volunteers a tray filled with Snicker’s bars, M & M’s, chocolate chip cookies, and Oreos, chocolate was not much more exciting than a crust of dry bread. In other words, chocolate’s attraction does not come simply from its creamy texture or deep brown color. It appears to stimulate the same part of the brain that morphine acts on. For all intents and purposes, it is a drug—not necessarily a bad one and not a terribly strong one, but powerful enough nonetheless to keep us coming back for more. As common as chocolate addiction may be, it is by no means the only potentially addictive food, nor is it the most dangerous. In PCRM’s research studies, when we take people off meat, dairy products, and other unhealthy fare, we often find that the desire for cheese, in particular, lingers on much more strongly than for other foods. While they might like ice cream or yogurt, they describe their feelings for cheese as a deep-seated craving. Could cheese really be addictive? In 1981, Eli Hazum and his colleagues at Wellcome Research Laboratories in Research Triangle Park, N.C., reported a remarkable discovery. Analyzing samples of cow’s milk, they found traces of a chemical that looked very much like morphine. They put it to one chemical test after another. And, finally, they arrived at the conclusion that, in fact, it is morphine. There is not a lot of it, and not every sample had detectable levels. But there is indeed some morphine in both cow’s milk and human milk. Morphine, of course, is an opiate and is highly addictive. So how did it get into milk? At first, the researchers theorized that it must have come from the cows’ diets. After all, morphine used in hospitals comes from poppies and is also produced naturally by a few other plants that the cows might have been eating. But it turns out that cows actually produce it within their bodies, just as poppies do. Traces of morphine, along with codeine and other opiates, are apparently produced in cows’ livers and can end up in their milk. If you examined a casein molecule under a powerful microscope, it would look like a long chain of beads (the “beads” are amino acids—simple building blocks that combine to make up all the proteins in your body). When you drink a glass of milk or eat a slice of cheese, stomach acid and intestinal bacteria snip the casein molecular chains into casomorphins of various lengths. One of them, a short string made up of just five amino acids, has about one-tenth the pain-killing potency of morphine. What are these opiates doing there, hidden in milk proteins? It appears that the opiates from mother’s milk produce a calming effect on the infant and, in fact, may be responsible for a good measure of the mother-infant bond. No, it’s not all lullabies and cooing. Psychological bonds always have a physical underpinning. Like it or not, mother’s milk has a drug-like effect on the baby’s brain that ensures that the baby will bond with Mom and continue to nurse and get the nutrients all babies need. Like heroin or codeine, casomorphins slow intestinal movements and have a decided antidiarrheal effect. The opiate effect may be why adults often find that cheese can be constipating, just as opiate painkillers are. But French researchers fed skim milk and yogurt to volunteers and found that, sure enough, at least some casein fragments do pass into the bloodstream. They reach their peak about 40 minutes after eating. Cheese contains far more casein than other dairy products do. As milk is turned into cheese, most of its water, whey proteins, and lactose sugar are removed, leaving behind concentrated casein and fat. Cheese holds other drug-like compounds as well. It contains an amphetamine-like chemical called phenylethylamine, or PEA, which is also found in chocolate and sausage. And there are many hormones and other compounds in cheese and other dairy products whose functions are not yet understood. In naloxone tests, the opiate-blocking drugeliminates some of cheese’s appeal, just as it does for chocolate. Meat-lovers defend their food of choice with remarkable ferocity. 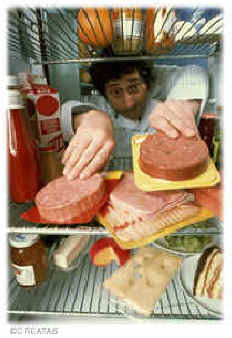 An April 2000 survey of 1,244 adults revealed that about one in four Americans wouldn’t give up meat for a week even if they were paid $1,000 to do it. People from Asian and Hispanic backgrounds were more willing to accept the hypothetical offer (fewer than 10 percent turned it down), presumably because meatless choices are major parts of their traditional cuisines. But others were more reluctant, with 24 percent of whites and 29 percent of blacks absolutely unwilling to swap meat for cash. Cholesterol, fat, salmonella, E. coli, Mad Cow disease, and foot and mouth disease may come and go in the public’s mind, yet meat-eating goes on. If you are hooked on sugar, chocolate, cheese, or meat, what do you do about it? Actually, foods can come to your rescue. If you start your day with a good breakfast, hunger is less likely to fuel cravings. And if your lunch, dinner, and snacks include foods that keep your blood sugar steady throughout the day—beans, green vegetables, unprocessed grains, and fruits, for example, instead of sugary foods or white bread—you’ll be less likely to dip into unhealthy foods later on. And there’s nothing like taking a three-week break from unhealthy foods. 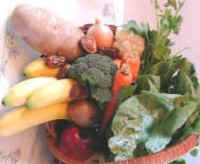 A low-fat, vegan diet skips the worst of the food seductions. And if, for even a few weeks, you set aside whatever foods are leading you astray, you’ll find your resolve is much stronger than if you had eaten them yesterday. Cheese consumption in the U.S. rose from 15 pounds per person per year in 1975 to more than 30 pounds in 1999. And you can thank the federal government. The USDA Report to Congress on the Dairy Promotion Programs for the year 2000 described how the government and industry worked with fast-food chains to make sure that cheese was prominently displayed in menu items. One federally sanctioned program launched Wendy’s Cheddar Lover’s Bacon Cheeseburger, which single-handedly pushed 2.25 million pounds of cheese during the promotion period. Another promoted Pizza Hut’s “Ultimate Cheese Pizza”—with an entire pound of cheese per pizza—selling five million pounds of it during a six-week promotion in 2000. And in 1996, cheese was not a required ingredient in Subway sandwiches. So a similar federal program helped the restaurant chain promote cheese and include it as a required ingredient in two new sandwiches, the Chicken Cordon Blue and Honey Pepper Melt, anticipating the sale of an extra 70,000 pounds of cheese.